Click the MENU icon above to explore the site. Promoting excellence in the safe, effective and appropriate use of medication in animals, thereby improving animal health and well-being. Raising awareness of public health implications arising from contact between humans and animals. Facilitating fully accredited training & Continuing Professional Development (CPD). 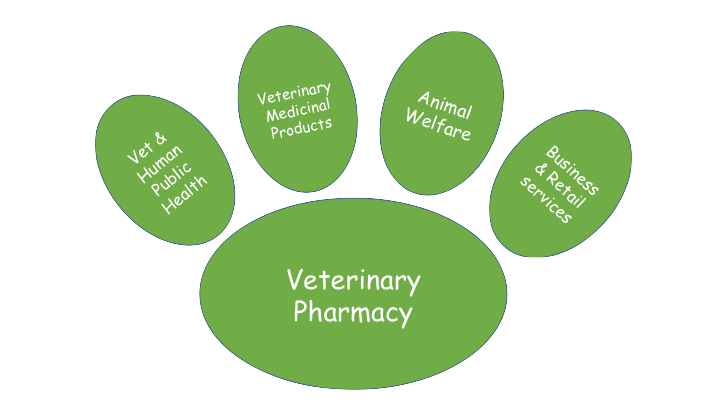 Until 2008 the Royal Pharmaceutical Society of Great Britain (RPSGB) actively supported a Veterinary Pharmacy Group, which was run by a Committee of elected members and administered by a staff member. This provided a forum for discussing matters of interest amongst its members, responding to Consultation documents. The VPG also ran a number of events including successful weekend conferences and visits around the UK, Ireland and beyond. Overseeing the Society’s Veterinary Pharmacy Diploma programme was also part of its remit. After the RPSGB became the RPS in 2010, the VPG was disbanded and replaced by a Veterinary Pharmacy Forum (VPF) with minimal support. Pharmacists who had formed the VPG Committee assumed similar roles in the VPF but with limited resources almost all activities ceased. Since then the Veterinary Pharmacy Education Programme has moved to Harper Adams University (HAU) and has been extremely successful with six MSc candidates expected to graduate in September 2017. The VPA will be supported by HAU, an RPS and AMTRA accredited training provider.